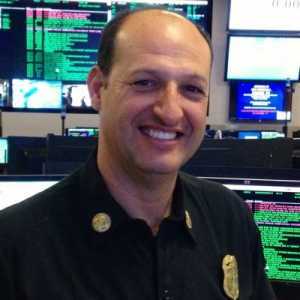 Carlos Calvillo is an Assistant Chief with the Los Angeles Fire Department. A 30-year veteran of the Fire Department he has been assigned to both administrative and operational commands in the LAFD. He is a strong advocate for firefighter safety, administrative due process, and workforce development. He is actively involved in projects that reflect the professional core beliefs of the Los Angeles Chief Officers Association and represents the C.O.A. He is currently the Chief of Metropolitan Fire Communications more commonly referred to as “MFC” or “Metro,” is responsible for processing 911 and non-emergency fire department calls, and subsequently dispatching LAFD resources. The facility is located at 500 E. Temple St., which is adjacent to Fire Station 4 and the Los Angeles City Emergency Operations Center. The communication center works in concert with numerous allied agencies including: the Los Angeles Police Department (LAPD), the Los Angeles County Fire Department (LACOFD), the Los Angeles County Sheriff’s Department (LASD), and others, to ensure a coordinated response to emergency incidents throughout the region.